I am not torn about whether to put up a tree or a menorah; I'm not really in the mood for either. I consider myself to be culturally Jewish (more than anything else at least) but still, Hanukkah seems to be all about consumerism and with everything going on in the world is it really necessary to be partaking in this sort of holiday cheer? I hear you. Yesterday, “Cyber Monday,” I saw so many glittering images online, presents begging to be purchased, promising joy…for an unbeatable price! This sea of products can be an escape from the winter doldrums, to be sure, not to mention larger global unrest. Sometimes, I will scour the internet and book a hotel room with an ocean-view on the other side of the country - knowing full well that I will cancel it within 24 hours, just to imagine for one afternoon that I am with my family in that warm space resting in crisp sheets amidst all those towels that don’t need laundering. What am I looking for in those moments? An inner solace, something that I will not find on kayak.com, though I do like to imagine. The holidays are a high-anxiety-making time, and the purchase and exchange of goods can certainly add to that. Reading books to my toddler about Hanukkah is one way that I reground myself. How many years had it been since I thought about Antiochus oppressing the Jewish people from expressing their freedom of religion? Or that Hanukkah translates as rededication? It had been many many years, December. When I read the words to my daughter I find a way in, outside of what feels like a parade of materialism. Is there anything in your life that you would like to rededicate yourself towards? An interest, a passion, a further exploration of what you refer to as your cultural Judaism? You display a sensitivity to the larger world and the imbalance that the consumerism triggers. Today is #GivingTuesday; maybe there is a way to redirect and rededicate yourself by giving to a charity or cause that matters to you. Or to any practice that feels restorative and centering. Because the world is fractured and the days are gaining in darkness and chill, I find myself craving the possibility of miracles. Though stressful, the holidays offer consolation, spiritual solace, a type of magic and grace that I find myself in need of now more than ever. My daughter knows that we do not celebrate Christmas, though she has started asking me about the possibility of a “winter party” different from Hanukkah, she was quick to clarify, where presents will also be exchanged. I think she has the good sense not to inquire about a tree. These images pervade our culture, and what child does not enjoy gifts? She will get Hanukkah presents, though she will not get the additional winter party. She will hear me read about Antiochus and rededication over and over. She will grate potatoes with me and we will put them into hot oil until they are crisp and brown. We will bring them to our friends and family. We will give tzedekah. I will do my best to teach her what the holiday is about, how blessed we are to be able to express our faith freely, and to dedicate our lives to what matters. December, that feels like all we can do. The winter is just upon us. Our tradition asks us to bring in extra light for eight days and nights. However you decide to spend the holidays, take in that warmth. We have recently moved from the NYC area where we were devoted to our small unaffiliated congregation for over ten years, to a region with fewer options for community. We joined and have been attending a congregation not too far from our new home and everyone is nice enough, but the services feel very alienating and uninspired to us--the music is largely unfamiliar and feels more like its being performed for us than inclusive; the rabbi's attempts to lead discussions feel awkward and not intellectually or spiritually challenging; themes of the holidays are pretty run-of-the-mill and even boring. I know that our expectations are high from our previous experience, and maybe I should just let go. But I'm wondering how much I should stick it out and get used to their ways, how much I should try to assert some changes that might make things more to my taste, and when I should give it up and find a different place. How nice are the people? I’m kidding. But only partially. It does not sound like your new congregation is satisfying your intellect or your spiritual yearnings, but it is worth something that you describe the people as nice and I wonder, as you get to know them better, if there’s potential to collaborate and dream towards a service that would be more satisfying to you collectively. I would caution you from rooting your suggestions too much in nostalgia for your old congregation. I am sensitive towards this struggle. As Dan and I have been building community, some people have shared their longings for past settings, and while it is very important - and useful - for us to take in feedback and strive towards improvements, there are moments when I wonder if someone who is always cleaving to vestiges of temples-gone-by will ever open themselves and be fully present in what we’re building now. I absolutely think that you should engage yourself in your current congregation - and enlist others too - to revitalize the community. The most vibrant communities that I have observed have active, passionate lay leadership. Maybe you will spearhead a chavurah of rigorous Torah discourse or become involved in another capacity that reinvigorates the congregation. This may not address the challenge of what you describe as a lackluster leader, but there might be enough there to engage you, to find a place - and people - that you wish to return to each Shabbat. Perhaps the rabbi is not the best sermonizer, but is gifted at comforting congregants in their mourning and is a pillar of support in times of need. Maybe as the congregants elevate the vitality of the synagogue the rabbi will rise to the occasion; I hope so. It is quite possible too, Bereft, that you will take on this massive work of trying to improve the current setting and it will not take, or it will still not feel like your spiritual home, and then you will have to seek out the next option. The trick is that you will not know for sure until you let go of comparisons to the old place. You need room in your heart and your head and your soul to take on the awesome task of engaging in your current community. Bereft, you will have to give up being bereft. You can be wistful, but you’re part of something that is flawed and human, among people who are likely yearning for more. You’re going to need to anchor yourself, live in the present and rename yourself. I know that you can do it, Hopeful. I attend a congregation where both the men and the women are invited to light the Shabbos candles, even though traditionally, it is women who do candle lighting. I never join, and don’t like being asked. I am curious about your thoughts about the matter. Allow me to explain. The candle lighting on Shabbos is traditionally done by women. Only women can bring in sufficient light and warmth into a home. I accept that I am missing that in my life, and am trying to make changes that will better enable marriage at some point. Changes I should have made earlier in my life. But I’m trying to make them now. Still, I’m not going to pretend that I am not lacking that warmth and light, or that I can create that myself. I know it doesn't really work like that. You do not need to light the Shabbat candles. There are congregations, of course, where you would not be asked to light candles, but I am assuming there is a good reason - or many reasons - why you choose to be where you are, so my question for you is how to engage in your community in a way that feels authentic and meaningful. You could subtly recuse yourself during this one ritual act, but I wonder if there is room in the congregation for you to honestly and openly discuss the issue. I think that your reasons for opting out, for deferring to the women in the community, are worthy of discourse among the people with whom you are gathering to pray. Are women the only ones capable of bringing in light and warmth? Well, I know there are some women who would not bring in that light, and there are men who are capable of providing that warmth. Though, in my home, we do follow a more traditional paradigm: I am the one who lights the candles and I embrace this act and many of the traditional roles (which some might call “retro”) of being a wife and a mother. I believe that these responsibilities hold great power. I carried two pregnancies, birthed two healthy children, and dealt with the hormonal aftermath, twice. It feels less political - and more personal and spiritual - when I acknowledge that, in my marital partnership, there are differences between me and my husband. Ones that feel so undeniable that the acceptance of distinguished rituals feel like an organic extension of that; this is what feels true and authentic in my home. Of course, there is more to your question than the discomfort that you express surrounding candle lighting. You are seeking a partnership with a woman, one whom you hope will illuminate your life. And you are trying to change and grow in a way to make space for this to happen. That is beautiful. Part of this growth might be pushing yourself to express openly, and with candor, the questions that you have about egalitarian rituals. You are trying to cultivate more light in your life, Unlit. And this involves being honest with yourself and those who you are inviting into the most sacred acts in your life. Even if you arrive at a respectful difference of opinion, you may feel more comfortable once you do this. I believe that true egalitarianism leaves room for these differences. Own your commitment to tradition amidst a setting that explores change. I used to be so invigorated by this time of year, but as I get older I find that the shift of the seasons leave my sensitive soul feeling rocked - jolted out of place and that my spirits take a dip as the weather cools and the days darken. I want to reclaim my love of Fall, pumpkin pie, and the changing leaves. Any advice on how I embrace this fleeting season? What you are feeling is real. A few years ago, I attended a weekend “Winter Blues” tour of the Brooklyn Botanic Garden, standing in a crowd of people - all ages - in sunglasses and scarves looking for those last leaves of Autumn and the silvery-white plants that live all winter. At one point, the licensed psychotherapist guiding the walk pointed out the golden wheat, and rustled her hand through it - creating a crunching whoosh. I was humbled remembering the Sunday mornings of earlier years, when I stood on long brunch lines with friends, craving harvest-frittatas and blood-orange mimosas, before I sought out tours to let in even just a sliver more light. I am responding to you, now, by my living room window - where the surrounding brownstones already feel like they are obscuring too much of the sun. I also have my seasonal light machine providing an extra glow which I plug in each October and unplug in May. I am drinking warming teas and honey shipped straight to me in Brooklyn from the fields of Portland, Oregon. After so much invigoration - New Year, the start of school, second chances, there is a natural coming down that happens in October; I know now to prepare for it, to stock up on the things that provide comfort, to go slow, to be extra kind to myself. It is hard. Your sensitivity to the change of light and cooling air is deeply human; the fleetingness of October is palpable. What can you do during this time of year that nourishes yourself? That reconnects you to what you once loved about this time of year? To engage the senses — a cup of warm cider at a nearby cafe, a walk through the crunching leaves, a good book that you can hold in your hands? Whatever it is, embrace this sadness as okay. (And, of course, if the mood takes more than a dip and you think it is helpful to talk to someone, then listen to that voice too). My four-year-old daughter is named for this magical season. When she fills her small pockets with acorns I am filled with the type of joy that I imagine reserved for some world to come. And, yet, the season is divided into these two halves: the colors, fullness of the early Fall, and then a barrenness, a reminder of the impermanence of everything. Dan and I just returned from a week with the kids in Philadelphia, visiting family and friends, taking in two weddings and the Fall foliage. That is the thing, I told her, and gave her hand an extra squeeze. It is the thing, Nostalgic. I am sending you a hug as I rustle my hand through the golden wheat. How do you make changes in your life? I get so overwhelmed thinking about how many things I want to improve, to do differently, or “better” in the New Year. I want to believe that people have the capacity to grow at any life-stage though the older I get, the harder it is to break habits. I want to believe that my thoughts and actions matter - to those I am close with and in a larger sense, but I get overwhelmed with where to begin. In my early twenties, when I first moved to New York City, I heard a rabbi mention that he said the Shema prayer whenever he heard an ambulance pass. He imagined what it would be like for the person in need of help, and their loved ones, to know that instead of cursing the sirens and the traffic, people were praying, directing their hearts and minds towards bringing the person in need to safety. I was struck by this, and took on the ritual. I usually pray silently, especially when I’m in public, so this was a private undertaking. But when my husband and I began dating, I confided this practice to him and soon enough he knew to pause - even if it just turned out to be a car alarm - and let me do my thing. I am someone who gets easily overwhelmed and am often guilty of “sweating the small stuff” but I’ve come to realize that the flip side to this is celebrating the minutiae - that my capacity for joy and sorrow are in equal measure - and that small acts can hold great consequence. Maybe it is less about breaking old habits, and more about creating new ones to incorporate into your life. Find something that resonates, feels meaningful, and take that on. Your question lets me know that you are a deeply feeling person, someone who is concerned with things that matter. All of the sensitive people in my life get overwhelmed because they feel things to their core, and it can be hard to know how to channel this into action. I struggle with organization; I have fought with anxiety and depression; I have been known to take things too personally. But there is a flip side. For fifteen years, now, every time I hear a siren, I stop whatever I am doing and I say the Shema. I hold a stranger in my heart. I pray for that person and for their family. Your thoughts and actions do matter, overwhelmed. Begin anywhere you like, just begin. Shana Tova and a meaningful Yom Kippur. Ask the Rebbetzin: What Becomes of the Brokenhearted? I have been struggling with self-compassion--with holding all the different parts of my self in nonjudgemental regard. Buddhists talk of "maitri" which is translated as lovingkindness. Psychoanalysts talk of dialectical thinking--of not repressing and labeling. Psychology researchers like Brene Brown advise compassion, connection, and empathy as means to self-acceptance. The idea of being present to things I dislike in myself or are ashamed of and being kind makes sense to me intellectually, but it's hard to do. It's hard to feel ok about being "in process". So often I feel broken even though it's an unkind word to use. And I don't want to be self indulgent. Does Judaism have any teaching on this work of developing a more accepting and centered kind of personhood? One that leads to generosity toward others as well as one's self? Still, I deeply relate to your struggle, to the real stigma surrounding lives that are in process, and the shame that accompanies this experience. This is not theoretical for me. I experienced a type of brokenheartedness that felt unbearable after the birth of my first child and I lived in the shame of that struggle. The emotional pain was in my body - where my heart is - and I would hold both my hands to that place on my chest when I prayed. During those days and months, I wore my baby girl, her heart to mine, and walked through Prospect Park right after sunrise and before sunset. Everyday. It was hard - it felt impossible - to sit still in my own being, and so I walked and I prayed. At the time, a very wise friend told me that I was lucky; this suffering was the flip side to my sensitivity, my poet’s heart, to everything that would make me a wonderful mother. She was right; I was met with so much mercy as well as other kindred spirits once I accepted this part of myself and shared it with others, who in return revealed their own brokenness. When I try to pinpoint the location of the compassion that you are asking about, this feels like the place. I’ll be honest with you; when I first received your question I was not flooded with examples of self-lovingkindness from my Jewish education. It took me a while to enter this inquiry through the lens of Judaism. But brokenness resonated. And brokenness is the route I have taken to understand self-acceptance and forgiveness, which I believe lead to genuine compassion for others and oneself. Even on the most joyful of days - a wedding - it is Jewish tradition to smash a glass and allow that fracturedness into our consciousness. To be brokenhearted is to be human with a heart that swells of love, pain, forgiveness, strength. Embrace this; you are "in process" of being alive. Be kind to your dear self. What do you do when someone won't forgive you? I haven't lied, stolen, cheated, physically harmed anyone, etc. But I know that I have hurt the feelings of a friend who doesn't seem to want me in her life. In fairness, there have been friends that I have parted ways with over the same sort of human mistakes. How do I be more forgiving of others, and how do I move past someone who won't forgive me? I have a vivid recollection of learning the Yom Kippur forgiveness concept in Hebrew School. I took such things very literally and was concerned that my apologies would be accepted in time to secure my inscription in the Book of Life. But what if someone wouldn’t accept my apology,? I worriedly asked my fifth-grade teacher. She responded that if you sincerely asked for forgiveness three times and the person would not grant it, then you were automatically forgiven by God. I was thrilled to learn this news! It seemed incredibly reasonable to me, and I was satisfied with a loophole accounting for anyone who I imagined to be stone-hearted. I’m sorry; I’m sorry; I’m sorry! I would tell my older brother for entering his room without permission. As an adult, having made sincere apologies for more serious infractions, the triple-ask condition seems much less doable. Asking for forgiveness is hard, it is humbling and it can be incredibly awkward. When I sense that an apology is not accepted, my instinct is not to keep asking. You do not have to walk on your knees / For a hundred miles through the desert, repenting. So where does that situate us? The simple answer is that I don’t think that you can make someone forgive you any more than you can make someone apologize, or, for that matter, make someone do anything. A question that I ask myself at this time of year is why I need for my apology to be accepted. (To be clear, as you specified, we’re not talking about violations to a person's being or spirit, but the type of human errors that we all are guilty of in our relationships with others). Will someone’s forgiveness make me feel better / less guilty? Do I truly value my friendship with that person and want to fight to keep it? Have I adequately acknowledged my own role in the situation? I know that there are times when I have apologized with a secret hope to receive an apology right back! I had a very close friend who distanced himself from me after I was not present in the way he needed at critical point in his life. At the time I did not understand why he had cut me out; couldn’t he be more forgiving of such a dear friend who had been supportive through the years but also had their own full life wrought with busyness and challenges? And then, a few years later, I had my first child and a very difficult postpartum to follow. I understood, only then, the excruciating pain of being let down by people whom I had loved and trusted when they weren’t present in the ways that I had hoped. I wrote my friend a letter of apology. I would not have been able to do so any sooner; I simply didn’t understand until that moment. And that is really one of most the gorgeous and painful aspects of being alive and in relationships with other people: the longer you experience life, the more likely it is that you will be on all sides of these situations, granted the empathy necessary for understanding and for forgiveness. Sometimes it is too late to repair a friendship. And then you have to do the very difficult act of moving on. Sometimes these are necessary losses. (The book Necessary Losses by Judith Viorst is an excellent read on that point). Other times, you can - even if it takes years longer than you had hoped - repair a relationship. And sometimes, thank God, there are relationships that repair themselves; with enough time and a heart that has been pierced and mended on so many occasions, it is easier to accept apologies and to make sincere amends, less with the words sorry than with acts of love and kindness. Technology is destroying my family. There are screens everywhere. I am nostalgic for the days before iPhones, and gathering around to watch Family Ties. You are clear that there is a problem, and probably have a sense of what needs to be done. The question is how to change a bad habit, especially one that has become so ubiquitous. Part of this problem, is, of course, its widespread nature: everyone, it seems, is doing it - constantly checking their iPhones, Facebook accounts, handing their kid the iPad. Just last week, in fact, my four-year-old purchased a season of Peppa Pig from my Kindle which I had turned over to her while packing for a trip. When my husband grew frustrated, I tried to justify that it was, at least, a smart purchase. He was not amused, and I did come around to see the absurdity in trying to, in any way, qualify my toddler authorizing my credit card. I think that most of us know the crushing feeling of sitting across from someone who we love and are excited to spend time with, and having that person be distracted by an incoming email or text message. It is so addictive, the pull of the devices. I’m not certain if you were being hyperbolic in use of the word “destroy” to describe the effect of all of this technology in your home; perhaps its not an immediate destruction, but it is a slow eroding of what is most sacred - authentic human interaction with those you love and honoring that - in real time. Once you recognize that, there is an urgency to make change. Of course, all things in moderation. For now, in my home, screen-time for my daughter will only be on the actual TV, old-school style akin to popping in a video, not just to monitor what she watches, but to create one place where that happens and reinforce that TV is not for all times or all spaces. Same goes for other devices: Never during meal times. Your note made me nostalgic for the early aughts when I moved to NYC and lived with roommates who all shared one land-line; we had to coordinate our AOL dial-up, and there was a max of about an hour before you’d get kicked off the line. I composed messages in my head and my fingers raced to get the words out in time. The connection was slow and frustrating, but it was contained. We spent more time in the living room, together, listening to music and talking, or outside of the apartment, exploring the city. This does not have to be a time foregone. Enjoy the conveniences of the technology, but protect your family-life and draw boundaries. You know what to do, Distracted, and you can make it happen. Take the lead and reclaim what is dear. While I'm hardly what I would consider an observant Jew, Judaism is an important part of my identity. My parents enrolled me in a Temple's preschool and kindergarten, and later on, Reform Hebrew School. I want my 18 month old daughter to have the same foundation and sense of belonging in Judaism. When is the best time to start a child's Jewish education? My father had his Bar Mitzvah at age 30. My brother and I were in a temple pre-school and they offered a night class for anyone in the community who hadn’t gone through this rite-of-passage. He became a Bar Mitzvah with a group of adults including his father-in-law (my grandfather) and, incidentally, the family dermatologist. I didn’t know those specific details until this evening; I’ve been sitting with your question which at first yielded a simple response (now, of course!). But I felt pulled towards something deeper in your curiosity, and it made me think of my dad starting his Jewish education as an adult, and becoming the first in his family to take on this obligation. I called him to ask why. Your description of your Jewish observance is similar to my dad’s; he is not a religious man. But he had two kids and wanted to teach them that this was important, that it mattered. And he felt that taking it on himself was the best way to do so. Nothing that I have learned in Hebrew School, or any institution, moves me more than the thought of my dad (who had also, in my youth, given up his motorcycle and cigarettes) studying Torah as an adult and taking on this commitment. It’s this type of generation-to-generation that is so hard to explain; I can’t recall the content of my grandparents family seders which took place in my early life, but I remember - vividly - the folding-card-tables covered with thick linen that extended all the way into the living room and crawling underneath them with my cousins, brushing up against the legs of great aunts and uncles, a generation that has almost entirely passed, but is so alive in my core and the deep connection to my own faith. 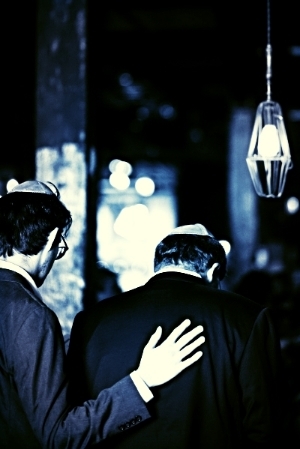 When you think about the ways that Judaism is important to you, what does it spark? Your daughter is quite young and you will be able to expose her to Jewish education in both formal and informal settings. I am confident, by your asking such a thoughtful question at a formative time in your child’s life, that you will will impart to her a Jewish foundation. Maybe it’s a preschool like the one you attended. Or it might simply begin with a weekly shabbat sing-a-long, attending a holiday service, picking out a challah together on Fridays, lighting candles, reciting a prayer. Whatever it is that ignited this question, start with that and share it with your daughter. The best time is now. My husband comes from an observant, conservative family where he grew up in a Kosher home. We keep a (loosely) kosher home as a result. The thing is I don't really believe in it. I do feel that it separates us sometimes from our peer group and I feel strongly that there are better ways to eat and shop and would love to make better choices about the meat we eat. It's hard for me to make a convincing case to my kids when I myself am not convinced. I hear you. And this is a hard one. Of all the Jewish customs and rituals, kashrut is the one that has felt most like a sacrifice to me. I grew up in the type of Jewish home where we had a separate set of meat and dairy dishes, but the joke was which plates to use when we ate shrimp. I loved shrimp. We used to order it as a topping on our pizza from the same joint that made a delectable Philly cheese steak. In my early twenties (before I met my husband), I was curious about taking on more Jewish observance, and that's when I began keeping a version of kashrut: no pork, shellfish or straight-up milk and beef (ie cheeseburger). It was a tentative process. I used to order a Japanese bento box lunch-special and eat just one shrimp shumai dumpling, placing the other uneaten one back in the bag as some sort of offering. I wasn't sure if kashrut was what God required of me, so it was like splitting the difference, just in case. Eventually, I could do without both dumplings, even amidst the uncertainty. What we put in our bodies and what we feed our children is personal and political. Thankfully, there is ever increasing awareness around food, which yield more options; I take my four-year-old to the farmers market to support local food. We buy our meat from Grow and Behold, which offers kosher pasture-raised meat without antibiotics or hormones. And it is delicious. When we barbeque with non-kosher friends, we just bring enough to share. Your description of your loosely kosher home tells me that you and your husband are into tradition but not dogma, so I hope the dialogue remains open and you continue to make choices that honor the customs but speak to your own family. Your kosher home does not need to look exactly like the kosher home of the previous generation. Finally, there's a piece in here which I think you deserve recognition for, and that's honoring something that you're not certain about, simply because it is important to someone that you love. That, to me, feels deeply Jewish and it is a beautiful thing. What qualities make a good mother? I have been ruminating upon your question for days. It is a deceptively simple inquiry. I can think of a host of qualities - starting with patience, kindness, love -- that make someone a good mother, and yet, none of these characteristics seem to encompass the awesomeness of that role, or unravel the complexity of the definition that you're seeking. I know scores of patient, kind, loving women who have berated themselves for not being a ‘good enough’ mother, or who have been so completely shredded and rebuilt by the process of birthing and raising a child that it requires great pause to even begin to describe themselves again. When my daughter was a few-months-old, I walked into my therapist's office carrying a dessert cookbook. I am not a baker, but language had betrayed me in those early days of new motherhood and it felt impossible to describe the panic and grief that I was experiencing at the time. "The lemon squares on page fifty make me feel calm,” I told the counselor one afternoon, handing over the book which sat on my night table next to the bible. It was a humbling moment to admit that ritually looking at pictures of beautifully curated lemon bars was the most effective way for me to stave off the chaos inside me, but there it was, an unexpected antidote to a terrifying new motherlove. That and the Hashkiveinu prayer, which I recited with my husband, every night before bed. Dear God, please let us lie down in peace and wake up again to life. Guard our coming and going for the sake of your goodwill mercy and compassion. Please protect us from famine, plague, destruction, hatred, terror, fear and from our own yetzer hara. Shelter us in the shadow of your wings, O God, now and forever, over all your people, Yisrael. I had never recited this prayer before becoming a mother; for me, the words encompassed the surrender necessary to separate from my baby and into the unknown each night. And separation is a very important quality of a good mom. Just as essential as love. That might be it, in fact. A generous balance of love and separation. The rest is commentary. Thank you for your question, Curious, and for giving me much to reflect upon. Ask the Rebbetzin: Progressive values, conservative rituals? My husband and I are committed to raising children grounded in conservative Jewish rituals, community and values, yet we are progressive, liberal thinkers who believe in expanding their world, not limiting it in the ways religiosity can. Frankly, we believe religion can be extremely divisive and it worries us. So we struggle with how to balance the cliquishness and therefore the limits of traditional Judaism with our politics of open-mindedness and embracing a worldview without limits. Help. First, I want to express my gratitude for this question. Truly. You have articulated a concern that is shared by a lot of people. Many of whom I know, respect, love and admire. Often I find this sentiment conveyed as a statement - a reason for opting out of religion - and one that eclipses any further conversation on the topic, so I am particularly thankful for the question, for your struggle and for your engagement. I hold different communities dear to me, sacred: My writer-friends, my mom-friends, my colleagues in the arts & humanities. But even before I married a rabbi, and into Conservative Judaism, (I was raised Reform) I would sometimes wander around, alone, on a Friday night looking for a place of worship - a sanctuary - to enter. I spent those days amongst artists and musicians and academics, and it was an existence full of the type of richness that I had aspired towards: cultural. But what I didn't do in those circles was pray. Or study Torah. And something in me craved that type of connection. A decade later, married to a rabbi, I have witnessed people reaching out to us with a similar yearning. They are successful and engaged in the world and in the vibrancy of the city. But they are wanting for something else. Religion at its worst is awful. Many things at their worst are. At its best, though, it has expanded my compassion and worldview beyond any other cause or community. When I pray I feel a gratitude and love and longing that is more centering in my own humanity - and in recognition of the connectedness to others - than any other act. And while I enjoy any thorough text study, there is an incredibly powerful aspect of struggling through the Torah - even the deeply disturbing parts. I feel your conflict. I admire how committed you and your husband are to keeping the traditions amidst the ambivalence that you describe. That push and pull are real and it is hard. It is made more difficult by the limiting beliefs of what religion is or has to be. Bring your open-heart-embracing-willingness and acceptance into your rituals and that's what your kids will absorb, and everyone around you too.